There’s so much to do in the land down undah! 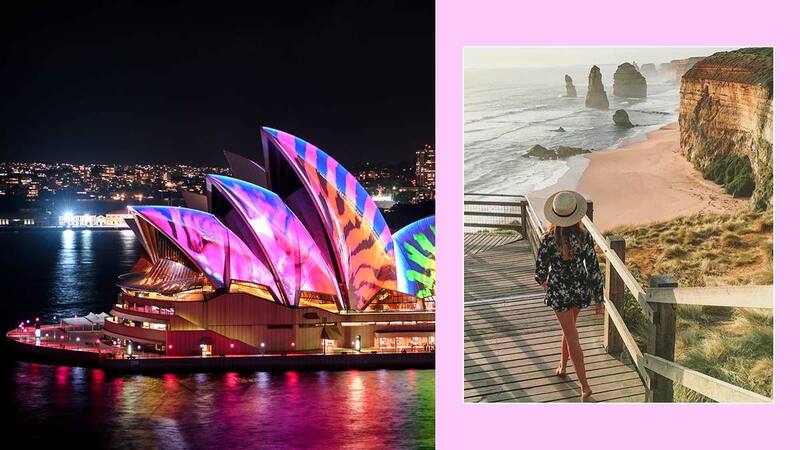 Australia boasts so many delights—from art-filled laneways to ultra-hip hangouts, from bustling business districts to charming coastal scenes, from adorable animal encounters to astounding natural views—it’s impossible to cover them all in one trip. While locally operating airlines will bring you through direct or connecting flights to Sydney, Melbourne, Brisbane, Perth, and the Gold Coast, there’s more to see in this sprawling country if you just hit the road, hop on a ferry, or jump on a domestic flight to other destinations. Quick FYI: You’ll need a visa to visit the land down undah, so you’d have to apply for one through a third-party agency or DIY your application through the Australian Government’s Department of Home Affairs website. Catch the New Year’s Eve fireworks at Sydney Harbour. What better way to welcome 2019 than by witnessing a spectacular fireworks display light up the Sydney skyline? With Sydney being one of the first major world cities to ring in the new year each year, kick off 2019 ahead of the folks back home by trooping to your vantage point of choice—or better yet, booking a cruise—to catch the 9 p.m. family-friendly fireworks and the main spectacle at midnight. Marvel at the jaw-dropping light displays of Vivid Sydney. Catch a festival—be it music, art, film, culture, food, whatever! Australia loves its festivals; on any given month, expect to find one brewing in its many cities. Music fans can go cray at Splendour in the Grass in Byron Bay (July), art enthusiasts can see creativity cranked up at the Melbourne International Arts Festival (October), those who just want to see something different will feel right at home at the fringe festivals—go with whatever floats your boat! Another thing Australia loves: markets. Weekend markets, outdoor markets, seasonal markets, and permanent markets gather everything from food and drink to thrifted goods and one-of-a-kind finds. In Sydney, worth checking out are the collectibles and specialty selections at Balmain Market and Rozelle Collectors Market; when in Brisbane, pencil in food trips to Jan Powers Farmers Markets and Eat Street Markets; if you’re ever in Melbourne, a visit to Queen Victoria Market is a must for all of the above and more. Have a street art photo sesh. Count on Australia’s random laneways and neighborhood streets to surprise you with pops of art. When in Sydney, be sure to check out the long, regularly changing strip of murals in Bondi Beach. Headed to Melbourne? You’re in for a treat in one of the world’s street art capitals—pay a visit to Hosier Lane to see what we mean. Pose against a backdrop of Jacaranda purple. Forget cherry blossoms—see Australia’s answer to the famous blooms when you head there from October to December. Be charmed by lavender-crowned trees in Sydney, Melbourne, Brisbane, Adelaide, Perth, or in the town of Grafton, which kicks off a nine-day Jacaranda Festival every end of October. Coffee is serious biz for Aussies—anywhere in this country, a mean flat white awaits. After Italian and Greek migrants fled to Oz post-World War II, coffee culture absolutely flourished in the country—no wonder they don’t need the likes of Starbucks at all. Melbournians in particular pride themselves on their coffee, so if you’re a caffeine snob yourself, head to this city for a cuppa to remembah. Have a toast amidst awesome views. Don’t just drink—drink with a killer view! When in Sydney, nurse cocktails at Opera Bar right by Sydney Opera House or at the spots around Darling Harbour; when in Melbourne, catch both sunset hour and happy hour at the bars by Yarra River or at Fitzroy’s rooftop haunts; when in Brisbane, stake out a spot overlooking the Brisbane River at Eagle Street Pier. Go strike up a convo with those chatty Aussies while you’re at it. Go on a picturesque wine tour. Wine more your thing? Find a tour operator online and be on your way to boozing in various wineries. From Sydney, head to Hunter Valley; from Melbourne, to Yarra Valley or Mornington Peninsula; from Perth, to Swan Valley or Margaret River—these are just some of the spots that will treat you to both superior libations and stunning sights. Gain a history lesson through guided tours at historic spots. In Sydney, learn how convicts transported by the British Government came to live in Australia in the 18th century with tours at The Rocks, Hyde Park Barracks, or Cockatoo Island. From Melbourne, head to Sovereign Hill in Ballarat, an open-air museum that recreates the scene of the Australian gold rush of the 1850s. Aboriginal tours and experiences around the country also give tourists a chance to witness the living culture of the land’s traditional owners. Feel like a kid again at theme parks. It’s a vacation—childlike fun is on the menu! Step inside the massive clown face entrance of Luna Park in its locations in Sydney and Melbourne. When in the Gold Coast, hop from Sea World’s marine animal encounters to Wet‘n’Wild’s thrilling water slides to Warner Bros. Movie World’s blockbuster-inspired rides. Dare to take it to the extreme. Not content with child’s play? Australia’s got something for all you daredevils! Conquer the Sydney Harbour Bridge through BridgeClimb Sydney, which will have you defying gravity as you scale the arch of the commanding Sydney landmark. Brave enough for skydiving or bungy jumping? Look up operators in Melbourne, Wollongong, Cairns, the Gold Coast, and more. Hit the beaches in the summer months. If you’re traveling from December to February—summertime in Australia—spread out a beach blanket and soak up the sun at popular spots such as Sydney’s Bondi Beach, Coogee Beach, and Manly Beach; Melbourne’s St. Kilda Beach; and the Gold Coast’s Surfers Paradise Beach. To experience powder-soft, blinding-white sand, Whitehaven Beach on Whitsunday Island is the place to be. Even in the cooler months, Australia’s beaches are worth the trip for the visual delights that await. Sculpture by the Sea, a free annual sculpture exhibition featuring works by artists from all over the world, heads to Perth’s Cottesloe Beach in March and to Sydney’s Bondi Beach from October to November. If you’re in Melbourne, the brightly hued Brighton Bathing Boxes are a sight for sore eyes. Take in the natural wonders. Straya ain’t done with ya! From exploring seaside sights in Sydney, spend the next day immersing in natural wonders at Blue Mountains, where scenic waterfalls and the towering Three Sisters rock formations can be found. When in Perth, drive on to surround yourself with the tall, ancient trees of Valley of the Giants, or see thousands of limestone pillars standing in the sands of the Pinnacles Desert. Underwater sights are not to be outdone—Australia is home to the Great Barrier Reef, after all! Go on a Great Ocean Road tour. Want to hit a string of sights all in one day? From Melbourne, join a tour or hire a car to conquer the 150-mile Great Ocean Road, which will take you to everything from surf spots to quaint towns, from waterfalls to wild koalas. Keep your eyes peeled for the Twelve Apostles, larger-than-life limestone rock columns that rise from off the shore. Catch the Field of Light at Uluru. No doubt one of Australia’s defining landmarks is that giant red rock in the Northern Territory, Uluru (Ayers Rock). From Sydney, take a three-hour flight to witness 50,000 solar-powered spindles illuminate its surroundings in changing colors through the Field of Light installation that runs until December 31, 2020. While you’re there, learn about the land’s Aboriginal traditional owners, the Anangu people, through presentations and tours. Straya doesn’t just house natural wonders; it’s home to the cutest critters, too! In Sydney, visit Taronga Zoo to see native Australian animals like the koala and the kangaroo, plus many more. Melbourne has the Melbourne Zoo, and a road trip takes you to the waddling little penguins of Phillip Island Nature Parks. The state of Queensland has Australia Zoo—home of The Crocodile Hunter, the late Steve Irwin!—and Lone Pine Koala Sanctuary. From Perth, take a ferry to Rottnest Island where cuddly quokkas await. Enjoy a moment of chill at a park. There’s no shortage of public parks in Australia where you can savor picture-perfect calm: Sydney’s Royal Botanic Garden and Hyde Park; Melbourne’s Royal Botanic Garden and Kings Domain; and the various botanic gardens and neighbourhood parks that dot the different cities. Ahh, just the thing you need after all that insane sightseeing.